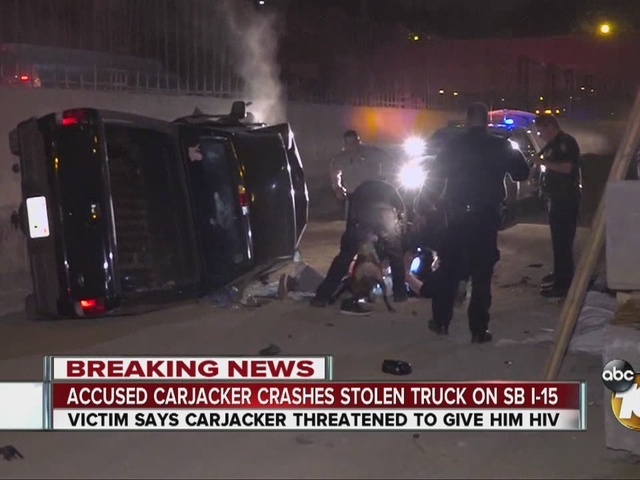 A man accused of carjacking a teen in the La Mesa area earlier Monday has crashed the truck he allegedly stole, according to police. A 17-year-old boy was leaving a taco shop on Parkview Way off of Jackson Drive around 3:30 Monday afternoon. 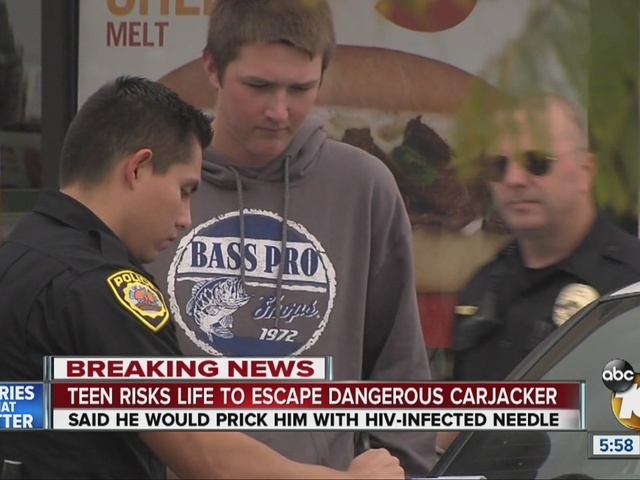 A man approached him and threatened to stab him with an HIV-infected needle if the teen didn't drive him somewhere. The teen complied and the two proceeded to drive around for about 30 minutes. The man, who the teen said appeared under the influence, kept telling the teen to take him to Wal Mart, but never decided on a final destination. They were stopped at a red light on Waring Road and Orcutt in San Diego when the teenaged driver saw an opportunity to escape. According to the teen's father, the man was about to use a syringe to shoot drugs. That's when the teen jumped out and got away. He ran to a nearby 7-Eleven for help. The man then moved over and took off in the teen's truck. Police located the suspect in the 2000 Ford Ranger on southbound I-15 around 10 p.m. The suspect then crashed into a construction zone near University Ave. He was taken away from the crash on a stretcher. The victim's father did not want to talk on camera to 10News, but said the man who stole the truck also had the keys to his apartment. He said his son had never seen the man before.